These are options shared among all chart types, whether they are pie, bar, 3D or 2D. Background Type: Determines the type of background to use for charts. Gradient - Use a smooth vertical gradient as a chart background. Solid Color - Use a single solid color as a chart background. Background Colors: If a gradient background is selected, the left color determines gradient's top color, while the right one determines gradient's bottom color. If a solid color is to be used, the right color is disabled, and the left color is used to fill the entire background. You can click on either right or left color square to change it. Axes Color: The color used to draw X and Y axes of the charts for those types which have them. 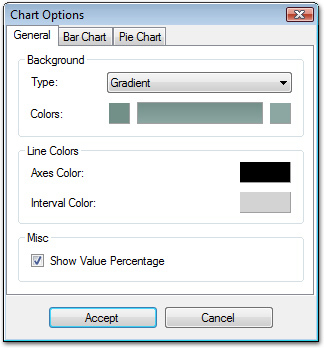 Interval Color: The color used to draw guide lines on the chart itself to allow easier reading of values. Show Value Percentage: If checked, a percentage of the total chart data value will be shown. It will be included in the item label on the chart for the pie and the horizontal bar charts, and will be a separate label for the vertical 3D bar chart.